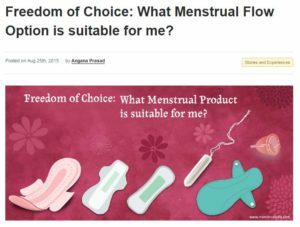 Freedom of Choice: What Menstrual Flow Option is suitable for me? 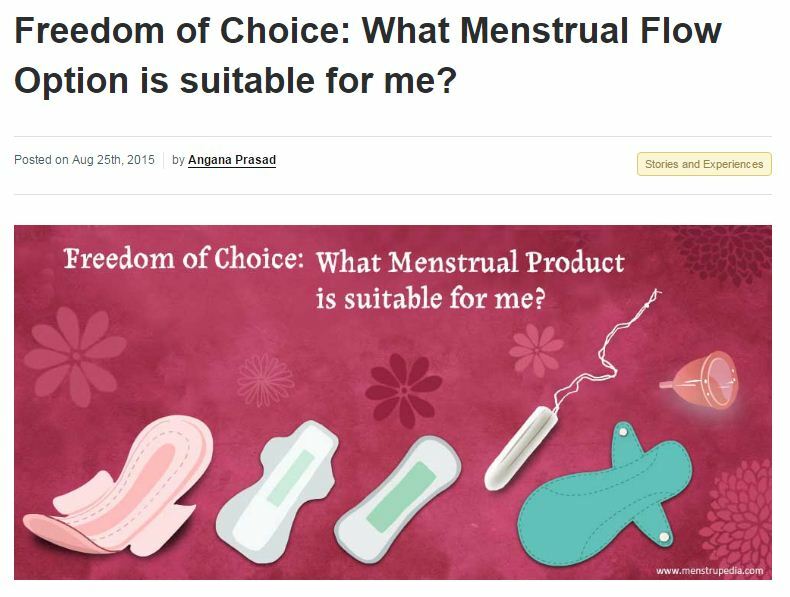 The original article penned by Angana Prasad, was featured in Menstrupedia Blog (http://menstrupedia.com/blog/freedom-of-choice-what-menstrual-flow-option-is-suitable-for-me/) on August 25th, 2015. A lot has been written about menstruation and Menstrual Flow Management options lately. While the disposable pads industry is going crazy promoting their newest (also most expensive) ultra leak-locking system equipped pads, a lot of other companies and NGOs are running to promote alternate flow management options through highly populated social media platforms. With the sudden boom in attention towards this issue, a lot of different aspects are being hyped at different intervals, some of which even I, as a Menstrual Educator, do not feel comfortable with. I feel that a lot of harm has already been done by prevalent regressive menstrual practices, a lot of which might have started off as an acknowledgement to the life-giving phenomena a woman is blessed with, but are currently no less than distorted versions of their original selves. However, the struggle of a lot of Menstrual Educators these days is to educate young girls and women about what is happening in their bodies and to then break the stigma around menstruation and re-present menstruation as a positive phenomenon to do away with the shame associated to it. Considering half the world’s population feels tied down because of menstruation, this task is obviously pretty huge. Then of course, there are some elitist menstrual activists, who bring in the aspect of celebrating periods and push images of blood stained pants through social media platforms. I see campaigns like these as detrimental to the larger cause of making menstruation normal. I have seen even the most educated people cringe at the very popular Instagram post of a girl’s stained pyjamas and have denied us (Project KHEL) from conducting awareness sessions on Menstrual Hygiene Management in their schools, because 1) they do not feel their girls are unaware or feel awkward about their periods and 2) they didn’t want their girls to participate in ‘weird’ campaigns celebrating their periods and to take the female population to another extreme from feeling pulled down by their periods to feeling like people who deserve and are entitled to privileges just because periods make them ‘special’. Here, I will also add a disclaimer that my interaction with people comprises only a minuscule percent of the population and I am only sharing my own experience and observations and this certainly is not a universal response. I believe celebration of a phenomenon will be only the second step after it gets accepted by the individuals affected by it, but if we jump to celebrating without working on getting it to be normalized, then we will only be closing people up against the idea of getting educated on the topic. So now, to talk about pads – disposable or reusable or eco-friendly or anything else altogether. Few days ago, there was this article by another popular menstrual activist about how pad selling organizations have been falsely depicting statistics of Indian women opting for unhygienic menstrual flow management options in order to maintain their sales of pads. This article had created quite a stir and lots of activists spoke up on how this was a dramatic reaction to the issue and better was expected out of her. We see that times have changed and the soil we walk on, the water we drink and the air we breathe has all been contaminated, so what might have been a safe option even 20 years ago, is not a good one today. Also, there is a famous saying that “when you have a hammer, all problems look like nails”. This is probably what was happening. Individuals in the cloth pad production business deem that as the best option and people in the disposable pads industry deem that as the ultimate solution. Also, let’s not forget that while some will always be after money, some others will be looking towards helping more and more people. In Project KHEL however, we believe that in the true sense of empowering an individual, comes this element of enabling them to make informed decisions and responsible choices. Also, as educators, our core agenda has been to help beneficiaries understand ‘how’ to think and it is not so much about pushing them towards ‘what’ to think. So, in every menstrual Hygiene Management session of ours, apart from imparting basic education of the phenomena, we talk extensively about the various flow management options available in the market. We discuss the pros and cons of using given kind of pads or cups. If women knew and understood what effects certain products could have on their bodies and their environment and the best options available in the market, along with some financial literacy, it will help them in making more effective choices and this is a sustainable solution for women’s menstrual health and environment related issues. Although there are certain other products like menstrual sponges, etc., we choose to provide information only on the aforementioned products as these are comparatively more popular and relatively more accessible.